Problem Solving Strategy: Have hammer, seeking nails. Allow me to explain where that 15 comes from. 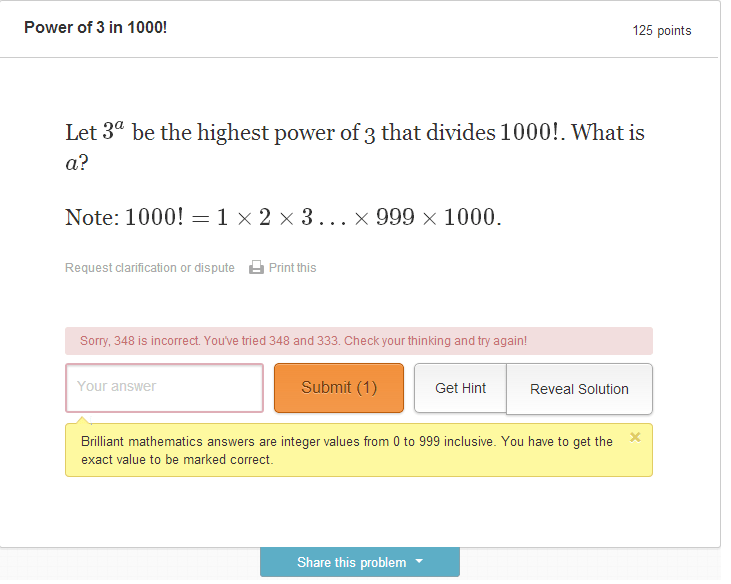 When I started the problem, my first thought was 333. I wanted to know how many 3’s would be in the prime factorization of 1000!, and I figured that I’d just count all the multiples of 3. I entered that without much further thought, and when I saw that it was wrong I realized that the other powers of 3 matter as well. In other words, I realized that I had to consider 3^2, 3^3, 3^4, 3^5, and 3^6. As so many of you pointed out, handling this realization is the key to solving the problem. Then — and I think that this is the important psychological piece — I tried to figure out a way to use that insight in the problem. I didn’t try to think through the problem again with that insight. I didn’t think of the implications of that insight, or try to count everything. Rather, I was trying to find a use for the new insight that I had discovered. I realized that if you have 3^2 as a factor of 1000!, that’s also going to be a multiple of 3, so it’s only going to be adding 1 factor of 3. Likewise, 3^6 (the largest power of 3 to divide 1000!) is only going to be adding 5 factors of 3. So, realizing that I needed to account for everything up to 3^6, I simply added the extra powers of 3 that 9, 27, 81, 243 and 729 would be contributing. That’s where 1 + 2 + 3 + 4 + 5 comes from. When this turned out to be wrong, for a moment I felt surprise. After all, hadn’t I used the insight? Once I got over myself, it didn’t take very long to get the right answer and realize where I had gone wrong. Anyway, the point of this all is that in the midst of problem solving, sometimes I seek a way to use an insight rather than use that insight to rethink the problem. Using that insight gives me a feeling of satisfaction and a sense of completeness with the problem. But, honestly guys, anything that would’ve slowed down my thinking and encouraged me to think through the problem (rather than find a nail for my hammer) would’ve helped me get to the right answer. I think it’s also worth considering what exactly we ought to be concerned about with a mistake like mine. My wrong answer contained the idea that would turn out to be crucial for solving the problem. I understood exponents. I understood factors. Really, the concern that we ought to have is that I’d make a similar sort of mistake when I solve the next problem — rush to use an insight rather than think through its place carefully. But what sort of feedback can a teacher give to help ensure that I am more careful in the future? Maybe the best thing that a teacher could do would be to give me an opportunity to reflect on interesting questions. Maybe, instead of asking students for revisions or corrections, we should ask them for reflections on parts of their work that interest us, or pique our curiosity. Posted in My Mistakes, Number Theory, Uncategorized.